Here are some things to consider during the pendency of the litigation: word to the wise: maintain control over the proceedings. Communicate as much as possible with your spouse, no matter how much you hate them! The last thing you should want is a trial where a judge who has barely met you will decide the most important decisions of your life in three hours or less. DO decide that divorce is what you want and not mediation, reconciliation or marriage counseling, all of which might be better choices. Divorce should be your last resort and you should consult with DROBAN & COMPANY, PC before having the conversation with your spouse. DO establish Temporary Orders immediately. This document is filed with the original petition and will get you into court faster, establish Child Support, Child Custody and visitation, as well as divide community assets and debts during your Divorce proceeding. DO comply with all terms and conditions of existing court orders until the Decree and/or Temporary Orders can be modified. DO plan a budget prior to filing for divorce and ensure that you have viable, sustainable resources during the pendency of the divorce proceedings. Download the Affidavit of Financial Information available on this site and estimate your potential earnings and expenses. This will help you plan for spousal maintenance and child support and make realistic adjustments to your expenditures. Make sure you know how much money exists in every account that you and your spouse hold jointly. DO make copies of all important documents like Deeds, mortgage papers, credit card statements and property information. DO obtain your own P.O. Box where you can receive all mail personally without interference. DON’T open up separate bank accounts and move assets after filing because you are concerned that you will be left without financial resources. Legal Fees are NOT considered “community waste” and may be drawn from a joint checking account. All funds are community property and you will wind up reimbursing the community or being held in contempt for violating a Preliminary Injunction. DON’T deviate from court orders; you will likely be found in contempt of court. DON’T obtain an Order of Protection in lieu of Temporary Orders just to expedite the judicial process; Orders of Protection should be obtained sparingly and in situations of real crisis. 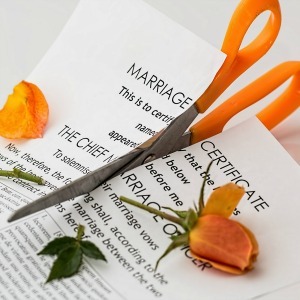 Unwarranted Orders of Protection will necessarily prolong the divorce proceedings, complicate visitation and create animosity between the parties. The Most Heavily Litigated Issue . . .
• Whether the spouse contributed (to his/her detriment) to the education and/or employment opportunities of the spouse.